Recurrent Neural Network RNN is a great tool to do video action recognition. 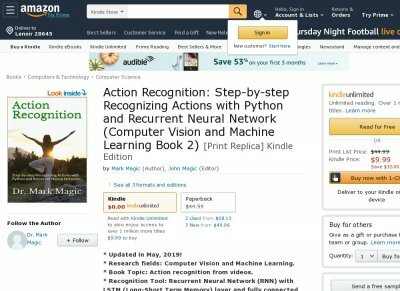 This book built an RNN Recurrent Neural Network with an LSTM Long-Short Term Memory layer and a fully connected layer to do video action recognition the RNN was trained and evaluated with VGG16 Features that were saved in .mat files the features were extracted from images with a modified pretrained VGG16 network the images were converted from videos in the UCF101 dataset, which has 101 different actions including 13,320 videos the dataset was developed by researchers from the University of Central Florida please notice that only the first 15 actions rather than the whole 101 actions in this dataset were used to do the recognition the codes were implemented step by step with Python in Jupyter Notebook, and they could be executed on both CPUs and GPUs free GPUs on Google Colaboratory were used as hardware accelerator to do most of the calculations for the purpose of getting a higher testing accuracy, the architecture of the network was regulated, and parameters of the network and its optimizer were fine-tuned for comparison purpose only, an SVM Support Vector Machines classifier was trained and tested. For the first 15 actions in the UCF101 dataset, the highest testing accuracy from the RNN is 86.97, which is a little higher than that from the SVM classifier 86.09. In conclusion, the performances of the RNN and the SVM classifier are approximately the same for the task in this book, which is a little embarrassed. However, RNN does have its own advantages in many other cases in the fields of Computer Vision and Machine Learning, and the implementation in this book can be an introduction to this topic in order to throw out a minnow to catch a whale.